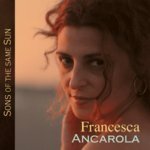 Sign up for Broadjam today to follow Francesca Ancarola, and be notified when they upload new stuff or update their news! A diverse and unique CD blending Contemporary Jazz, South American Folk, Classical Spanish and Flamenco, Pop & a little Rock. Her powerful vocals in both English & Spanish transcend cultural boundaries elevating the listener to a brighter world of peace and beauty where we are all Sons of the same Sun. Tell me where does the oblivion go? Of the darkness in love? Of our love...of our love? Tell me where do they go ?